Posted on 8, March 2016 by EuropaWire PR Editors | This entry was posted in Aviation & Aerospace, Technology and tagged Airbus Group, Airbus Perlan Mission II, stratospheric glider, Tom Enders. Bookmark the permalink. Minden, Nevada, 08-Mar-2016 — /EuropaWire/ — Airbus Group CEO Tom Enders worked alongside the all-volunteer flight test team for Airbus Perlan Mission II this weekend, as the program achieved a historic milestone with the start of pressurised flights. The Perlan 2 glider is designed to soar on wind currents to 90,000 feet as it researches high-altitude flight, climate change and the potential for wing-borne travel on Mars. 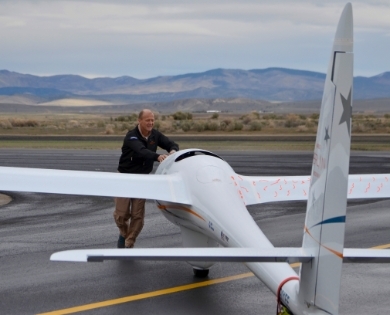 Enders received a detailed briefing on the custom-built glider and its systems from Airbus Perlan Mission II chief pilot Jim Payne in the program’s home hangar in Minden, Nevada. Perlan 2 relies on mountain waves – updrafts generated by winds crossing mountain ranges – to carry it aloft. To reach the record-breaking altitudes necessary for its research program, however, the team will deploy later this year to a region in Argentina where mountain waves fed by the polar vortex travel all the way to the stratosphere. The test flight program took a significant leap forward last week with a successful first pressurised flight, validating the system that will keep the crew alive in atmospheric conditions similar to those on Mars. Enders joined Payne inside the pressurized aircraft for ground testing of its life-sustaining systems, though adverse weather ‎conditions during his visit prevented the two from making a test flight. Although the air density at 90,000 feet is just two percent the density at sea level, the pressurization system will maintain a cabin altitude of 15,000 feet. The system allows pilots to safely operate without wearing the bulky pressure suits that hampered previous efforts to soar to the stratosphere in the unpressurized Perlan 1 glider. The crew of Perlan 2 breathes 100 percent oxygen from a rebreather system similar to what astronauts use in space. Interested observers can track the progress of the Airbus Perlan Mission II flight test program via Twitter @PerlanProject. Airbus Group is a global leader in aeronautics, space and related services. In 2015, the Group – comprising Airbus, Airbus Defence and Space and Airbus Helicopters – generated revenues of € 64.5 billion and employed a workforce of around 136,600. Airbus Group CEO Tom Enders worked alongside the Perlan 2 glider team in the programme’s home hangar in Minden, Nevada.